When the rat race gets to be too much, sometimes it's best to simplify . . . and maybe curl up with a classic. That's true both today and in the pothole-pocked future of Car Wars. 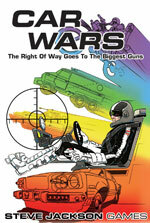 Get back to basics with Car Wars Classic, newly released to e23. This PDF set is everything you need to get going in the world of Car Wars. Within the 64-page rulebook are details on cars, characters, combat, and vehicle design. It also includes counters, a turning key, and even an arena map (in oversized and printer-friendly formats). It's a great standalone experience for anyone looking to rev their engines and ready their weapons -- in a package that can fit in your glovebox!